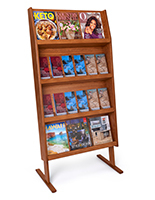 This 4-tier wooden pamphlet stand is a durable structure made of oak with an open shelf design to accommodate 2 magazines per level. 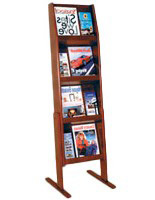 The freestanding literature holder is great for smaller waiting rooms or retail spaces that offer reading materials for purchase. 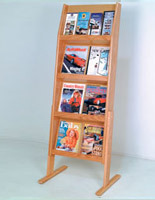 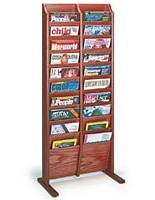 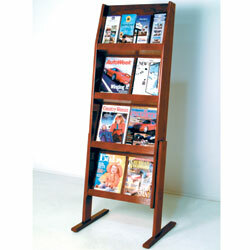 The pamphlet stand with red mahogany finish is able to accommodate many styles of décor. 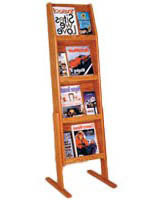 The oak literature holder comes with long feet on the bottom to help with stability of the unit. 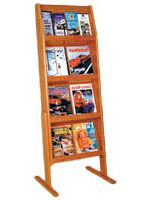 The stand is able to hold both magazine and brochures because of the lack of dividers on each shelf. 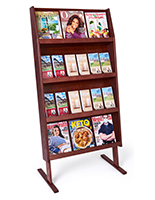 The freestanding periodical display is best used with more rigid catalogs to prevent them from slipping down or bowing over the fixture.